You're reviewing: Avg Antivirus 2015 - 1year / 1pc. 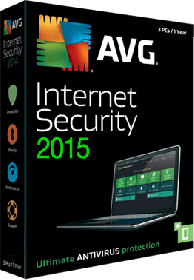 Avg Antivirus 2015 - 1year / 1pc. Get complete protection for what you do with all your devices. AVG Internet Security offers advanced protection against malwares, spyware, viruses, rootkits and other nasty internet links and attachments that can harm or manipulate the personal information on your PC, laptop or smartphone. Safeguard your future against harmful viruses and phishing attacks with an advanced security suite that won’t let you down. AVG Internet Security is the answer to real-time and reliable protection without you having to manually call the shots. It is automatic, all-round and affordable for all and will stop the latest threats on the internet from reaching your computer. World Class Protection – AVG Internet Security is the leading name in Windows, Mac and Android protection against web viruses, malwares, spam emails and online fraud and theft attempts. You will also be protected against malicious attempts at hacking or data theft. With over 25 years of delivering the highest standards in security, AVG is the name when it comes to being in the safe hands for more than 25 years and with the Internet Security suite they have exceeded expectations with one single package. Advanced Antivirus – While browsing the internet, your information is at risk from multiple directions. Thankfully, AVG Internet Security suite provides a comprehensive, all-round advanced protection against malware, spam, spyware, viruses, unsafe websites and links, suspicious files and attachments and even protects your USB and DVD Drives. Its advanced artificially intelligent software that automatically updates your protection and internet security against threats. It also keeps hackers and phishers at bay with its Enhanced Firewall feature. So, you can do whatever you want without worrying about your safety online. Scanned Security – The AVG Internet Security suite focuses on providing real-time scan for your computer against phishing websites, potential threats and malwares. So, you can test the performance and protection with a scan that covers the entire spectrum of your PC and gives you instant results based on the scan. Thus, with AVG Internet Security suite you can automatically perform routine maintenance and security scan as per your convenience and avoid harmful spyware, malware and phishing attempts on the internet with a daily or periodic scan. Feature Friendly – AVG Antivirus has always offered a gamut of essential antivirus features and with the Internet Security suite they have raised the bar in online protection with the AVG Internet Security. You will get antivirus protection which protects you against virus and malware, on top of which, you will also get access to the latest features like AVG Data Safe which automatically encrypts your data and personal information against identity or computer theft. By default, you get upto 2GB of data storage which is password protected and encrypted securely against online fraud and theft attempts. Additionally, AVG Internet Security suite comes with Email Protection that can be easily synced with your Microsoft Outlook account to safeguard you against spam mails. One For All – Now you no longer need to purchase separate antivirus and internet security software for your family members or workforce. AVG Internet Security suite is an all-in-one package that offers complete coverage against malware, spyware, phishing attempts and online scams for your entire family. You can install the software on unlimited PCs and safeguard your information easily. Thus, the AVG Internet Security suite is a winner when it comes to providing advanced online security and giving you the maximum value for your money. Supercharge Your System – The AVG Internet Security suite not only gives your PC and Mobile devices ultimate protection against viruses and malwares, it also helps restore your PC to optimum performance levels and helps to speed up your machine by cleaning hidden clutter. Now you can supercharge your system and get advanced performance as well as improve your laptop’s battery life considerably. Plus, you also get the benefit of automatic update of all your programs and apps to keep your computer running smoother and faster for longer. Why Should You Buy AVG Internet Security Suite? If you use a PC, Laptop or a Smartphone and care about your personal or professional information, the AVG Internet Security Suite is the best bet to protect your data against harmful viruses, malware, phishing attempts, spam emails and fake websites. Trusted By Millions – AVG is a recognized and renowned leader in global internet security and protection and has consistently delivered winning products for consumers around the globe. It is the best all-in-one antivirus and online security software that won’t let you down when you need it the most. After all, the positive online reviews are a proof that AVG clearly knows well what it is doing. Multi Platform Support – Whether you are a Windows or a Mac user, AVG Internet Security suite has got your covered with complete protection against online thefts, frauds, spams and viruses. It is always up-to-date with the latest operating system and protects your computer against new threats as well. AVG Internet Security suite is a feature rich software that works seamlessly across all platforms and devices without any performance issues at all. Ease of Use – AVG Internet Security is a simple to use security suite that offers maximum protection against viruses, hackers and malware. It does a great job at providing important in-built security features in a clutter-free and intuitive interface. You simply need to purchase the suite from the official AVG website and install it on your devices to activate the protection. If you have any queries or need any assistance, AVG provides phone and chat agents that are available 24/7 for you. These are minimum system requirements for installing Avg Antivirus 2015 - 1year / 1pc. CAD$11.99 | In Stock Want it Now? Order and receive your download instantly.